Research shows most adult addiction begins in adolescence, and if kids don’t abuse alcohol or use tobacco or illegal drugs before age 21, they likely won’t ever do so. Learn the essential SFP skills to keep your kids safe. with research-proven skills to create happy families, healthy brains, and addiction-free youth. Help reduce kids' use of alcohol and drugs. There are three types of easy-to-learn skills to protect kids from alcohol, tobacco, and drug use: Bonding, Boundaries, and Monitoring. Learn them, use them, and help us share them with others. We are committed to keeping our nation’s youth addiction-free by providing parents and youth with research-proven skills to develop healthy brains and prevent alcohol and drug use. Research shows most adult addiction begins in adolescence, and if kids don’t abuse alcohol or use tobacco or illegal drugs before age 21, they likely won’t ever do so. 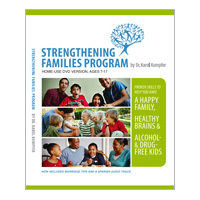 The good news is research shows addiction is an adolescent problem and can be prevented with three types of simple and easy-to-learn parenting skills taught in the Strengthening Families Program. They are: bonding with your kids, setting clear boundaries against use, and monitoring to see that teens always stay in an alcohol- and drug-free social environment. These effective, nurturing parenting skills can prevent ACEs and addictions—helping our nation stay prosperous and free. Please learn the skills, use them yourself, and help us make effective, nurturing parenting the new national pastime!